Perhaps I should do more disclaimers in my texts before heading into a subject, but here’s a disclaimer I definitely want to point out: nothing exists on its own nor have. This means that fashion as we know it today is a complex story with several, individual, things leading up to the present. With that said, the three things I’ve decided to pin down in today’s post have not contributed to the fashion of today more or less than other cornerstones I’ve left out (e.g. the liberation from the corsets, Chanel, unisex fashion etc). Depending on who you ask, different factors are highlighted and the ones I’m mentioning are only a part of the bigger picture. Gotcha? Got it! Here are three things that changed fashion! And oh, there’ll be a part two about present things that are defining fashion. Let’s start this by going way back to the 18th century and Marie Antoinette. Seldom has a historical person been so widely discussed, analyzed and targeted as the french royal. Antoinette’s lifestyle of splurge is nothing that needs to be repeated, but perhaps reminded. Her way of spending money and consuming products of luxury can indirectly be seen as one of the causes of the french revolution. While the people of France were struggling for survival, Antoinette threw parties and shopped new clothes (more or less). It is widely discussed though if she really were that arrogant in relation to the people’s situation (did she really say that they should eat cake?). However, her role in the fashion history is not solely about her role as a queen, but the way she and fashion designer Rose Bertin created a new way of fashion. Bertin is credited to be the person that made fashion sort of “cool”. Through Antoinette, Bertin made haute couture a subject for the public. She styled and designed for Antoinette during the majority of her time as queen. 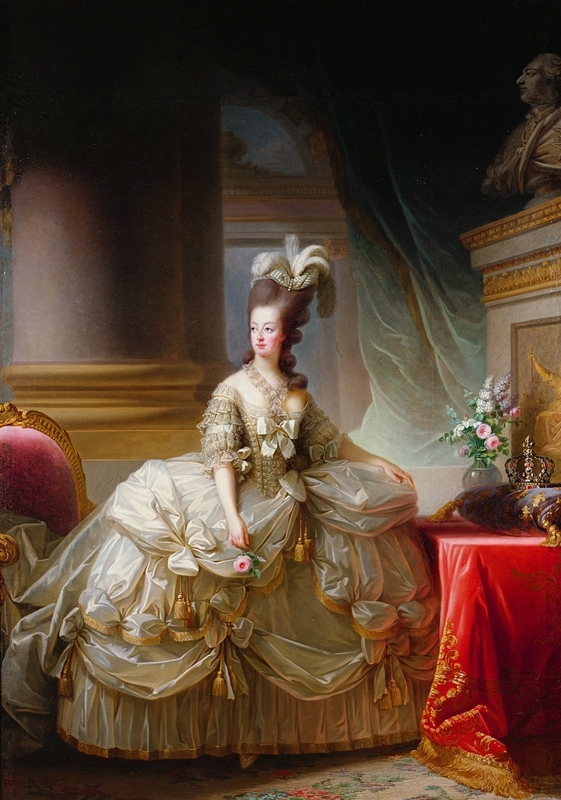 Bertin was in other words behind the excessive, grand, dresses Antoinette wore. Dresses whose style would inspire the rest of the fashion in Europe. Bertin cemented Paris as the fashion capital of the world and contributed to french fashion’s strong connection with the country’s culture and heritage. There’s not for nothing some of the biggest brands in fashion through history, and today, are french. Bertin made fashion french and Antoinette showed how. One of the most profound distinctions in fashion today is the difference in what gender fashion looks like. I’ll get back to this post in part two of this series, but shall give an historic background first. The gender fashion of today as we know it has not always been that way. If we’re talking the 17th century or the 18th century, men and women dressed rather alike. The men might not have worn the dresses, nor the corsets, but partly shared colors, prints and embellishment. If you take a look at the Rococo fashion, men wore pink, bows and floral prints too. Though the genders shared a similar fashion, women were considered by society to be secondary to men. This view would grow more obvious through fashion (just take a look at the different fashion of the 1950s) Depending on who you ask, this answer will differ, but around the early 19th century the foundation for the “typical” male fashion in the Western world was created. The “typical” male fashion was, and is, about dark colors, short hair and somewhat tailored and fitted pieces. You have the shirt, the costume and the colorless palette. Men working a color combination of red, purple and pink in one look are not considered, by the societal standards, to be a “common” man and dressed like a “gentleman”. A man that works colorful clothes, crazy prints and embellishments is an exception to the gendered fashion rules. It only gets more absurd when you think about it, but men’s fashion is a business that can be considered “serious”. By serious (that in this case is defined by the societal association of sans colors, prints and details), I mean a fashion that’s not centered to dressing up and play with clothes but used as a tool to match the image of professionalism and seriousness. That’s why women in business are considered empowered in a blazer and men in a floral midi dress is ridiculed. 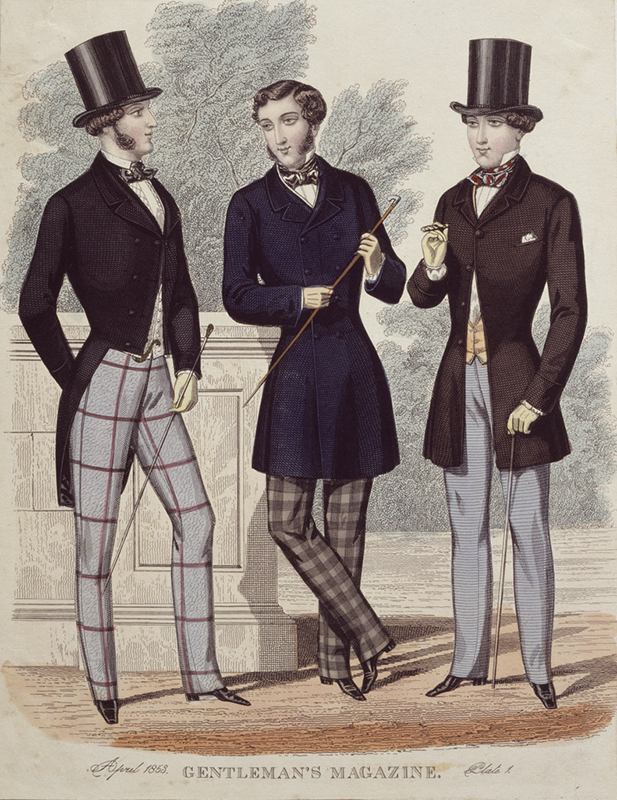 This idea of fashion, that men should only dress to reach a point of respect and not “beauty”, was partly created in the early 19th century and definitely cemented during the era. Dark colors, sans details and prints, short hair and tailored clothes. To be noted is that this is only a fragment of all the layers there is to gender fashion, its history and the societal perspective and the context I view it in. But more on that another time! It’s interesting to reflect where our popular clothes comes from. If there’s one thing that unifies the majority of the world’s people in a fashion context, I’d say denim would be one of those items. Denim might not be a more common fabric than simple cotton, but is undoubtedly more defining and adds a neutralized statement to any outfit. What most people tend to forget is that denim, in a societally accepted usage, is still a rather young fashion element. In the 19th century, jeans were made for workers that needed a durable material for demanding jobs. The jeans were a subject for the working class and remained that way for decades. As the 19th century and early 20th century still saw a clear difference between the classes, it was important to dress like your class. This was specifically true for the upper class that had no interest in wearing denim as this was a fabric that was associated with the working class. It wasn’t until the 20th century denim gradually would become acceptable for the daily wear and for, almost, everyone to wear. I’d say the war years had a crucial part in this as they shifted the focus in fashion from attribute to functionality. By the time the 1950s came around, denim as a fabric to count on was definite. 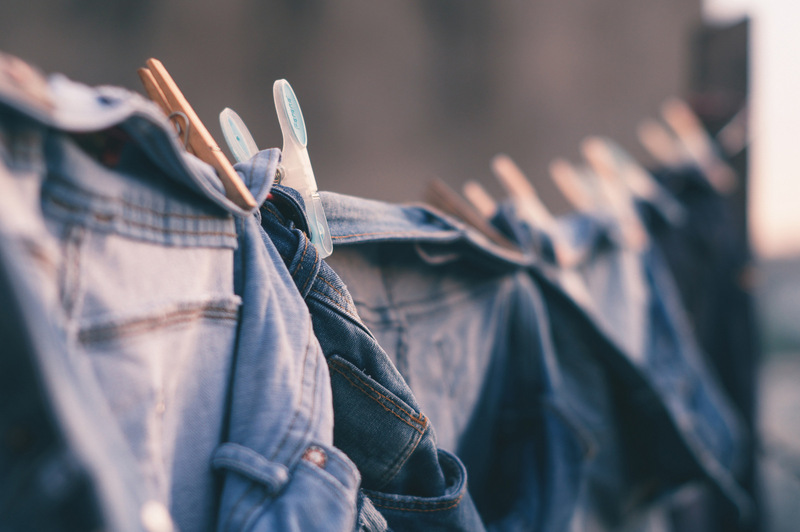 Hollywood celebrities like James Dean and Elvis Presley underlined the it-factor of denim and it’s been a subject of fashion ever since. To be noted though is that jeans are still considered to be a rather informal wear and not appropriate for evening wear or in situations where some kind of dress code is required. (Justin Timberlake and Britney Spears were quite the exception to this). Denim still has its strong connection to edge, labour and street wear (think the 90s grunge). Great history lesson! And so cool to know that Bertin was a woman. And funny how much mens’ fashion changed in a few hundred years from Louis the 16th time to the early 20th century. And oh yes I learned all about the history of denim when I worked in the Levis store. These are each such interesting influences that I haven’t ever thought to link before, but each truly has contributed to fashion in a massive way. I have always found Marie Antoinette so interesting, mainly due to the prevailing mysteries like her. Like you mentioned, one has to wonder if she truly was so out of touch or whether she was playing a role of sorts. Don’t you wish you could go back in time and ask her? How interesting! I loved reading this! I can definitely see how these have defined fashion through the years! I had no idea about the history of denim and how it was mostly worn by the working class. It makes sense when you think of it in context back then. I think it goes hand in hand with #2, as it merged genders, both embracing denim jeans as the years and society progressed. Such an interesting post; you know I love these sorts of posts 🙂 Thanks for sharing, gorgeous, and I hope you have a great weekend ahead! Great article! I love how mens fashion inspired women fashion because I love those strong silhouettes! Denim has been so major! Way beyond just jeans. Denim is SUCH a big one- and I love that it’s taking over more and more, and becoming prevalent in unexpected places. These are factors for sure. Denim is big for sure. Such a great review! Totally agree!! Great post, I love reading such articles on fashion. Denim is always my favourite. Sounds like a great history, thanks for sharing this. 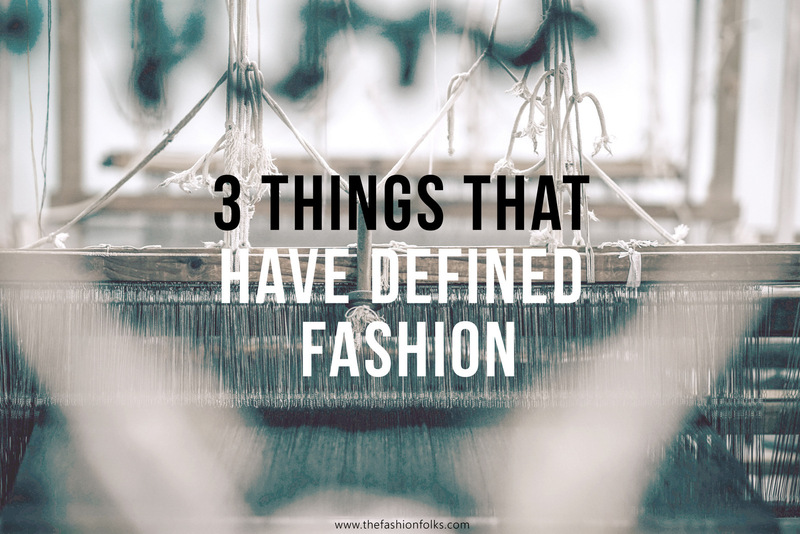 These are definitely three things that defined fashion! It’s so interesting to see how things have evolved. I’m so glad that denim was finally acceptable to wear casually! This is such a cool post! Love learning a little bit of the history of fashion! This is definitely one of your most interesting posts and I thoroughly enjoyed reading through it. It’s interesting how denim was initially for the working class, funny how fashion evolves over the years. A really well researched piece of writing. It’s interesting to see how fashion was affected by world politics and how it in turn impacted the world.